There’s an old Yiddish saying that goes like this: “Between two chairs, don’t sit on the floor.” The Hyde Park book buyer must heed this traditional wisdom, because our neighborhood is full of places to binge on de Beauvoir and score on Shakespeare, so much so that we often find ourselves paralyzed. 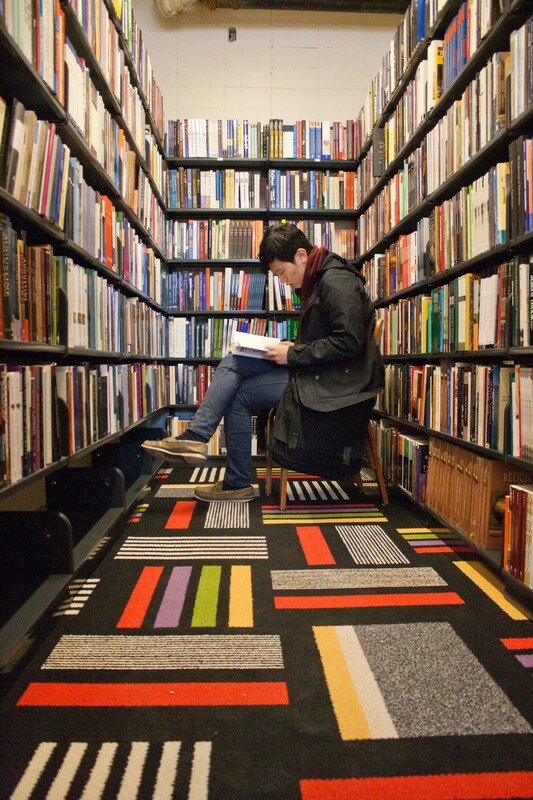 But what you really want is to be the opposite of paralyzed, the opposite of sitting on the floor—you want to be hopping from chair to chair, because there are four centrally-located chairs—um, bookstores—to sit in, and only four years to do it. Sit very still, and begin the serious work of finding a hiding place; finding calm and stillness; and finding bargains. Now are you still on the floor? Begin with the comprehensive 57th Street Books, a few doors before hitting Z&H and the Med if you’re walking East, away from campus; you will know it by the tiny, mossy awning above its entrance. Its insides hold a handful of magical cellar chambers. Rooms are arranged by subject; for more details, see the directory in the front. If you need to buy a gift for a kid, or enjoy reading children’s books yourself, 57th Street is the best place in Hyde Park to do that. Their collection of children’s books is phenomenal, providing both classics and new releases. A selection of postcards, stationery, and notebooks are in the front room, as is an unusually deep array of magazines and journals. A circular table in Room 3 always has the day’s Times. 57th Street Books is expensive—but worth it. 1301 E. 57th Street. (773) 684-1300. Hours: 10 a.m.–8 p.m. daily. Across the street from the old O’Gara and Wilson, which closed this past summer, you’ll find Powell’s Bookstore. One of three locations in Chicago, this Powell’s—a dense, oceanic patch of written word in the age of e-readers—is situated halfway between campus and the Point. Like any worthy explorer, begin with the end in mind. Know your mission. Come with an objective. Fiction is right ahead when you walk in the door; foreign languages are in the basement. And be prepared to climb: There are spots where the bookshelves meet the ceiling, threatening to push through like trees in an old-growth forest. Done the quick way, Powell’s can be a fast and simple bushwhack. Go when the weather’s nice in autumn and spring; it’s open until 11 p.m. 1501 E. 57th Street. (773) 955-7780. Hours: 9 a.m.–11 p.m. daily. By contrast, the University of Chicago Bookstore, a Barnes & Noble located conveniently on Ellis Avenue, is hardly ever open. It’s closed, outrageously, on Sunday, the second—or third—best day of the week to browse, and in the evening. The bookstore itself has a small selection for a Barnes & Noble and, honestly, kind of a shameful one for a university bookstore, as far as serious books go. It’s formulaic: textbooks upstairs, sweatshirts downstairs. And yet there’s pleasure to be had here. The self-help section is well-stocked, the trashy mags are glossy and plentiful, and the muffins from the adjoining café are delicious while paging through or studying the aforementioned texts and consequently being 15 minutes late to wherever. 970 E. 58th Street. (773) 702-7712. Hours: Monday–Friday 8 a.m.–6 p.m., Saturday 9 a.m.–5 p.m., closed Sunday. The Seminary Co-Op is no longer located in the basement of the seminary—soon to be the Becker Friedman Institute for research in economics—at South University Avenue and East 58th Street. This means that you, class of 2017, have the privilege—or is it the curse?—of being the first students to know the Sem Co-Op only in its modern, labyrinth-ish form. On the whole, current and future generations of students have a lot to gain from this reinvention, still full of crannies and still boasting the famous front table, where academics duke it out in an American Idol–style Battle of the Brains. The Co-Op is member-owned, with around 53,000 shareholders. Join them. It’s a matter of citizenship and of finance: In return for a $30 membership, you will start getting a 10 percent credit from each purchase (after an initial $100 spent) at the Co-Op, the 57th Street Books, and the Newberry Library Bookstore downtown. Each July, your accumulated credits will be given to you in certificate form, to redeem within the next year. Although a less beneficial system than the straightforward 10 percent discount members got until this past August, it’s a change we can stomach to keep the beloved store sustainable. Let’s see how Plein Air Café, the coffee shop across the hall, fares when it finally opens. 5751 S. Woodlawn Avenue. (773) 752-4281. Hours: Monday–Friday 8:30 a.m.–8 p.m., Saturday 10 a.m.–6 p.m., Sunday noon–6 p.m.